Teenage Mutant Ninja Turtles comes to 3-D life with these great mini-figures! This Teenage Mutant Ninja Turtles 3-Inch Random Figure Series 2 Mini-Figure is one in a line that features some wonderfully stylized action vinyl figures of your favorite radioactive turtles and most iconic characters from the show. Each figure measures 3-inches tall and is blind-box packaged with head and arm articulation for fun posing. This awesome collection even features rare chase figures for you to try and collect. 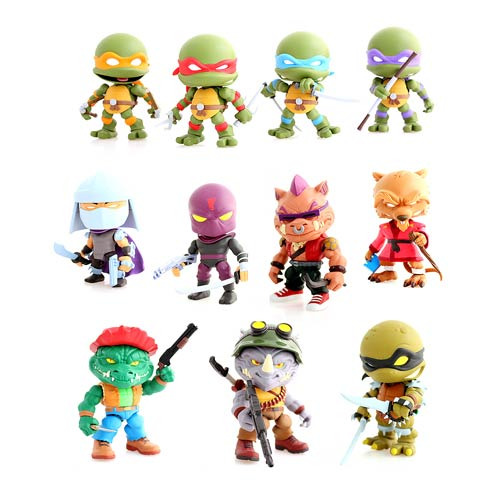 Series 2 features characters and designs from the animated series such as: Michelangelo, Raphael, Leonardo, Donatello, Splinter, Shredder, Foot Soldier, Bebop, Rocksteady, Slash, and Leatherhead. Ages 15 and up.